FINANCE can be a pretty explosive career, especially when your office is just a few hundred metres from Mt Arthur Coal in the Hunter Valley region of New South Wales, Australia. Mt Arthur Coal is an active coal mine belonging to metals and minerals giant BHP Billiton. "Our office is on the mine site, so we sometimes feel the explosives going off in the pit. "We're close enough to feel two to three blasts a week," says 40-year-old finance accounting manager Joel Chin. The mine is the largest individual coal production site in that region, turning out more than 19 million tonnes for local and international customers in the energy sector each year. 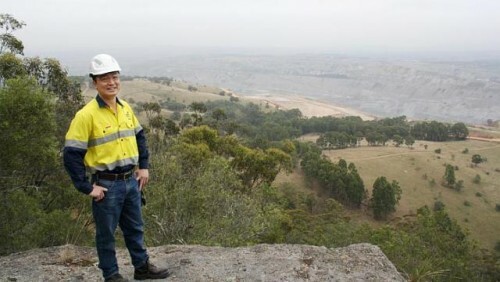 "If you have something that is made in Japan or Korea, there is a good chance it was manufactured using power produced by coal from here," Mr Chin says. While he might not be doing the digging, his job is still intense. He looks after the mine's financial statements, statutory reporting and corporate governance. Mr Chin joined Ernst & Young as an auditor in 1998 after getting his accountancy degree from Nanyang Technological University, realising his dream of donning a power suit in Shenton Way. Three years later, opportunity knocked in the form of a headhunter looking for an accountant for BHP Billiton's new Singapore office. "My interview was held in a hotel room and I reported to work at a makeshift work-space for a dozen people in Suntec City. The office wasn't ready then," he remembers. Today, Singapore is BHP Billiton's headquarters for marketing, with over 1,000 employees and contractors. Globally, it has 123,800 employees and contractors at 130 places in 21 countries. In 2008, Mr Chin was given the chance to trade in his suit for personal protective equipment and be based on-site in Townsville, Queensland. He and his wife went Down Under with their two-year-old daughter, Edna. Over the past five years, they have had postings in Townsville, Bunbury in Western Australia and now Singleton. They have also have a second daughter, Jireh. "There was always a possibility of things not working out, but it would have been a bigger regret not to have ventured," he says. As mines are in remote locations, and making new friends with each move takes time, the lifestyle takes some getting used to, says Mr Chin. However, he adds: "Being in a big global company means opportunities can surface anywhere, and so the adventure continues."